The concept for the app was to create something that allows Real Estate Agents and Homeowners to calculate their stamp duty, look up conveyancing costs, and copy and paste Special Conditions from the Special Conditions library right into their own legal contracts. We built an application the worked off line which allows users to calculate Stamp Duty using data supplied by the QLD OSR and the ability to search via keyword through the Special Conditions Library. Above is the homepage wireframe compared to the end result. Wireframing is an integral part of our planning process, and without it it’s hard to talk the same language when trying to convey exactly what we want to build. 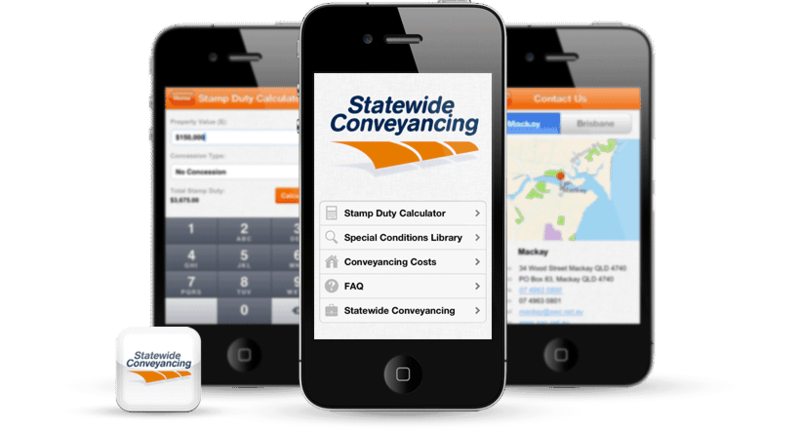 The Statewide Conveyancing dashboard is the menu screen for all other sections of the iPhone Application. The special conditions library is a list of legal terms for conveyancers to use. We built a powerful search that filters results in real time as you type in a keyword or words. Once you’ve found the Special Condition you want, you can click the result to view the full text, and then click a single button at the top right of the page to copy that text to your clipboard. Then you can paste that text into, say, and email you’re working on for a client. It’s a great way to quickly respond to questions when you’re out on the field. This tool allows Homeowners and Real Estate Agents quickly calculate stamp duty. The original pictured had a few extra fields, so in the final design we simplified the entire process so you can see all details on a single screen with real-time results. The “Calculate” button is provided as a usability button, but the results are actually calculated instantly when you change details. The FAQ gives users easy access to some of the host common Conveyancing questions. There is a simple list of questions, and on the next page you can read the full question and answer. The final screen gives users details on how to contact Statewide Conveyancing, the company we build the application with. This means if users have any other questions, or want to talk to professional, it’s only a screen away.